For Salmon: Pre-heat oven to broil. Place two filets on foil or baking sheet and drizzle with olive oil and sea salt. When oven is hot, place filets on middle baking rack. Cook for 10-12 minutes or until salmon is opaque in the middle. Remove from oven and set aside. When cool, remove skin and place in mixing bowl. Add celery, dijon, chives, Veganaise, and lemon juice. Season with salt and pepper. Mix well, set aside. For Beets: Pre-heat oven to 400. Place whole beets on foil or baking sheet. Roast for 1 hour to ninety minutes or until soft. Remove from oven and let cool. When cool, peel skins and chop. For Eggs: In small saucepan, boil 4 eggs for 10 minutes. Cool, set aside. When cool, remove shell and cut in quarters. For Haricots Verts: Snip ends and boil in small saucepan until tender but crisp, about 6-8 minutes. For Salad: In a large bowl, place washed lettuce torn into bite sized pieces. 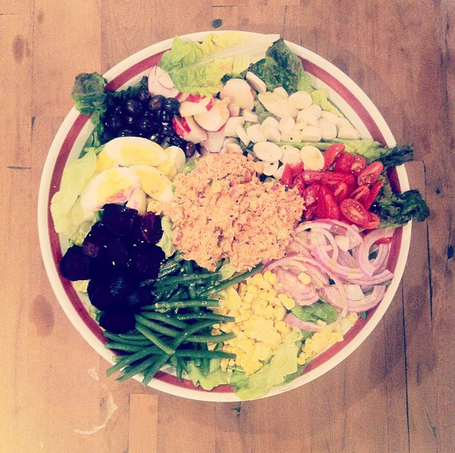 Around the perimeter of the bowl, arrange beets, eggs, haricots verts, corn, radishes, red onion and cherry tomatoes. In the middle, place a mound of salmon salad. Serve with dressing on the side.